3 drawings on paper, laminated (1 sheet) : ink ; 9.5 x 6 in. Ink drawings of men pounding for the New Year on December 31, 1942. Top image of two men pounding mochi in a mortar with kine, or pestles while another man depicted with only his head watches ; Okada stands on left pounding while Koide stands with back to viewer lifting kine above his right shoulder. 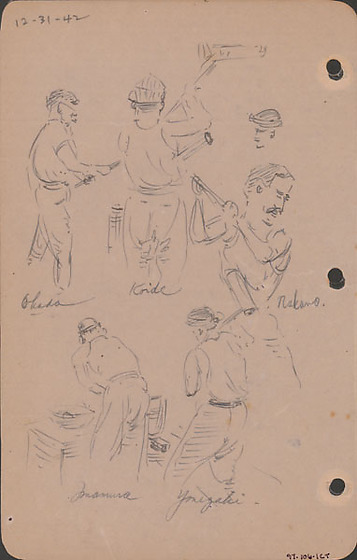 Middle left sketch of a man with a mustache, Nakano, swinging kine over his proper right shoulder. Bottom image of a man, Imamura, leaning over an usu, or mortar, turning mochi over as another man, Yonezaki, stands to the right lifting kine over his right shoulder ; both men are viewed from the back ; a table with a bowl is located nest to Imamura on the left. Drawing 97.106.1CS on recto of same sheet. Written in black ink, top left corner: 12-31-42. Written in black ink, top row (left to right): Okada, Koide, Nakano Written in black ink, bottom row: Imamura, Yonezaki.